Quality Management Bingo Cards to Download, Print and Customize! Print 2 pages of Quality Management Bingo Cards for free. Download a PDF with 2 free pages of bingo cards plus instructions and a randomized call sheet. 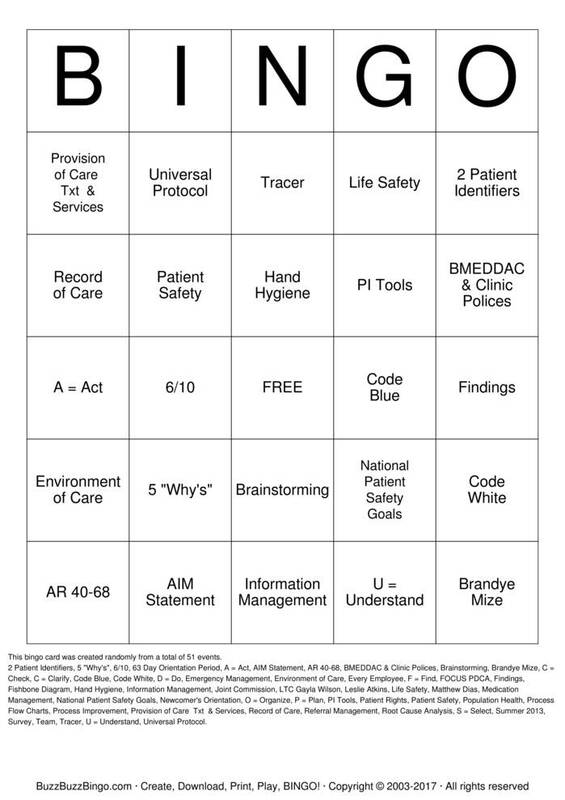 Play Quality Management bingo in a browser or customize the events, free space, etc. Purchase more randomly generated bingo card pages below. 2 Patient Identifiers, 5 "Why's", 6/10, 63 Day Orientation Period, A = Act, AIM Statement, AR 40-68, BMEDDAC & Clinic Polices, Brainstorming, Brandye Mize, C = Check, C = Clarify, Code Blue, Code White, D = Do, Emergency Management, Environment of Care, Every Employee, F = Find, FOCUS PDCA, Findings, Fishbone Diagram, Hand Hygiene, Information Management, Joint Commission, LTC Gayla Wilson, Leslie Atkins, Life Safety, Matthew Dias, Medication Management, National Patient Safety Goals, Newcomer's Orientation, O = Organize, P = Plan, PI Tools, Patient Rights, Patient Safety, Population Health, Process Flow Charts, Process Improvement, Provision of Care Txt & Services, Record of Care, Referral Management, Root Cause Analysis, S = Select, Summer 2013, Survey, Team, Tracer, U = Understand, Universal Protocol.